Hai Media Group’s House of Hee Haw! 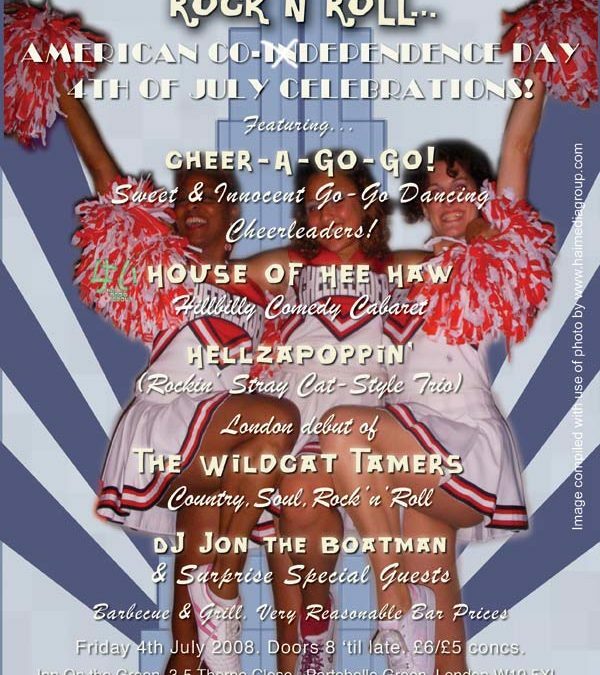 hillbilly cabaret comedy will feature at Little Bit Country, Little Bit Rock n Roll for the new country rock club night’s In Co-Dependence Day party celebrating America’s Fourth of July Independence Day holiday. “Get used to it! You’re stuck with us!” said Chyene Pride, who is the fun-loving founder of London’s live music and entertainment club night Little Bit Country Little Bit Rock n Roll. Chyene Pride is a talented country rock musician who has pooled entertainment talent from across London for this annual American holiday celebration. She’s also the lead Cheerleader in her dance troupe’s Cheer-A-Go-Go, and the lead singer in her band The Wildcat Tamers. 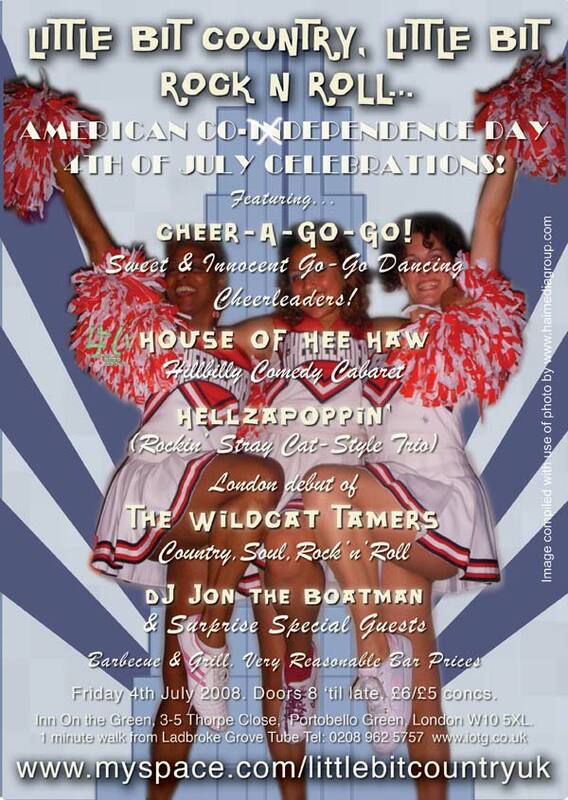 ***EVENT BONUS OFFER: Guests to Co-Dependence Day also get a FREE hot dog, and a cowboy hat to wear for the night. Print out the eFlyer and bring it along to get entry, and your free hat and hot dog. £5 entry fee. This month Hai Media Group (HMG) heads to Manchester, along with other digital media creative entrepreneurs from throughout the UK, for the conference bTWEEN08, where our agency is a finalist in the Branding Talent competition. How do you vote? Please sign up to the bTWEEN08 online community, a helpful resource for digital entrepreneurs, and clicking AWESOME for our entry! HMG has teamed up with media partner Isabella Hu, of Ecolocate, a design consultancy, to develop the seed idea for an integrated promotional campaign to support Littlewoods, a popular online shopping site for fashion and housewares. We’ve presented the judges with our Rare Fruits concept, that invites customers to pick rare fashion fruits of popular brands from the branches of trees growing on islands. The virtual world concept wraps around what we’ve already been told about Littlewoods new branding initiatives to build excitement with a television commercial involving a desert island, scheduled to be aired in the 2008 holiday season. Among our mentors for this experience will be 4talent (an innovation arm of the broadcaster Channel 4), Aegis Media, Just-b (the hosts of bTWEEN08) and Littlewoods. We join other finalists to develop our seed ideas into a full proposal for the client, during a conference workshop, and find out Friday, 20th June 2008, if our Rare Fruits campaign is a winner. We are thrilled to be joining our digital creative peers for bTWEEN08, and hope we have a good chance at winning the cash prize of £5K. Find out more about our thinking behind Rare Fruits over at Hai Media Group Director Lisa Devaney’s blog. 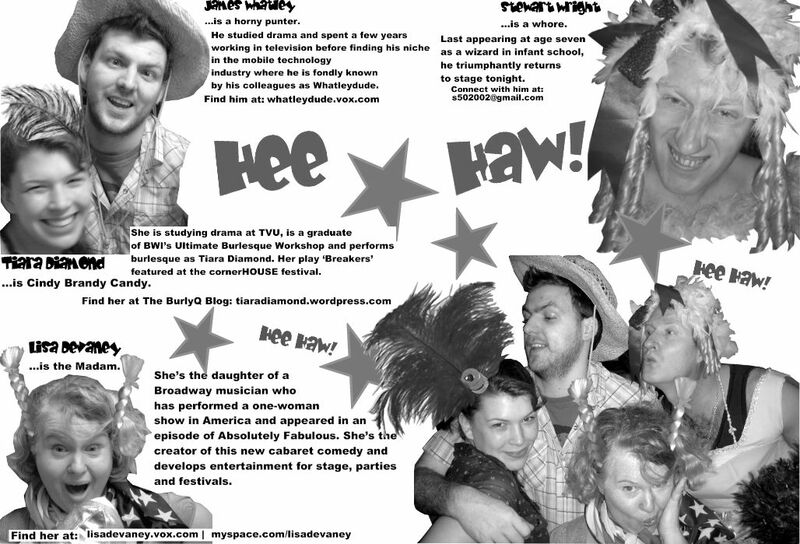 Now Booking: The House of Hee Haw! PRESENTING: THE HOUSE OF HEE HAW! The House of Hee Haw! is a new entertainment production of the Hai Media Group, following a well-received debut performance of this comedy cabaret act at the Finger in the Pie festival held at Madam JoJo’s in London’s Soho, on April 6th 2008, this comedy performance group is now booking appearances in the UK, EU and USA. This is rock ‘n roll entertainment at its best, offering an Americana-style slapstick comedy performance that is easily incorporated for any showcase evening of music, variety act line-up or as a participating artist troupe in festivals. The House of Hee Haw! can also be booked as a full club night event, for any venue, that combines original multimedia visuals with theatre, burlesque, live music, DJs, stand-up comedy, and visiting performance guests from the USA. Want to find out when the next performance is? Please join the House of Hee Haw! group on Facebook. London Loves to Hee Haw! Flavia Fraser-Cannon, courtesy of Finger in the Pie cabaret festival.